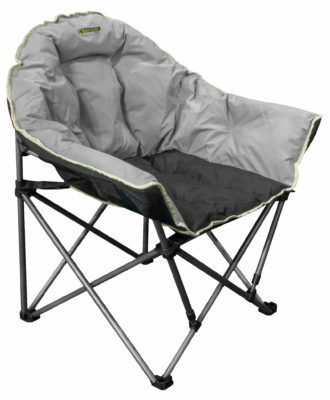 Sitting comfortably outside your motorhome, campervan or caravan? 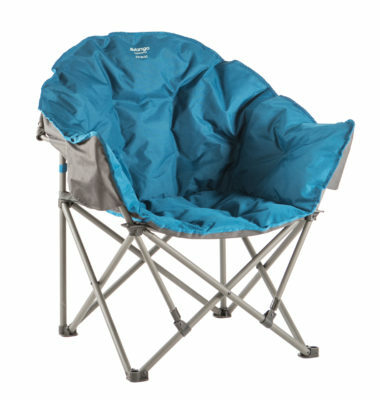 There’s no reason why not, with our guide to outdoor camping chairs. Unless you have a particularly clever caravan or motorhome, it’s unlikely you have any seating on-board that can be used outside when the weather is smiling. The answer? Outdoor chairs. They really do come in all shapes, sizes and at all prices. So, there’s no excuse for not sitting comfortably. Check out your camping neighbours and see what they use, and why. It’s a great way to start a conversation on site or at a rally. Packed dimensions can be just as critical as comfort. Look for designs that are easy to pack down (and, indeed, put up), but that can go easily wherever you intend to store them. Consider the weight and the impact on what you can carry in your caravan or motorhome. Also bear in mind you may want to use these chairs on future excursions. Quality does count, too. Generally, you get what you pay for. If you have any back trouble look for chairs with plenty of support, maybe some extra lumbar comfort. Typically, camping chairs don’t like being left outdoors for long periods – whether in extremes of heat or cold, rain or even the sun. Most chairs come with their own bags for transportation. They can also help in storage, with less likelihood of accidental damage. Check it’s easy to get your chair out as well as into its carrybag. There’s so many outdoor chairs on the market but here we take a look at a lucky seven star players. And don’t forget to check out our latest giveaway for a chance to win two Outwell Lake camping chairs, ready for the summer! At the double! The Sardis Lake is a conventional folding chair – but it’s large enough for two folk to sit in. And maker Outwell reckons it’s strong enough to support two people weighing up to 120kg each. There’s some padding for a bit of extra comfort, and there’s also a single side pocket, so you’ve got somewhere to put you magazine/book, sunglasses, drinks bottle etc. A strap helps pull it altogether tightly when folding it down to some 30cm x 30cm x 97cm. Seat height is 50cm and it weighs 8.1kg. The single version is the Granada Lake, and this padded folding armchair uses the same materials and side pocket, but with a more straightforward folding mechanism. Seat height is 48cm, pack size 60cm x 18cm x 75cm. It weighs in at 7.4kg and can take a maximum weight of 120kg. Opened out, it’s 76cm wide x 57cm deep x 98cm high. 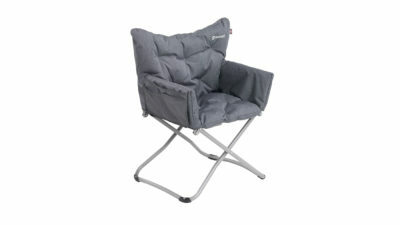 The chair for you if you like some wraparound padded comfort. It’s not the lightest at 6.2kg, but such is the design it can take a load of up to 140kg. New to the Vango line-up for 2019, the Entwine unfolds easily enough to some 40cm x 30cm x 110cm, with the seat area at 46cm from floor level. The colour choices are: Carmine Red, Mykonos Blue, Granite Grey. 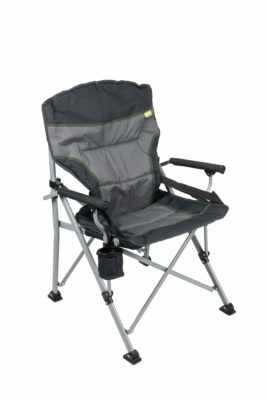 Key features Steel frame, 600D polyester padded fabric, carrybag with handle, two-year warranty. 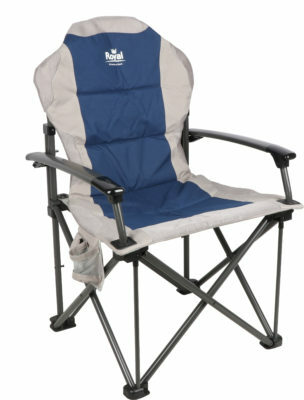 Shown here in blue/silver, you can also have this chair in black/grey or burgundy/black. It’s also a high back style adopted by other manufacturers. The sturdy steel framework accounts for much of the relatively heavy 5.4kg, although you do get a 100kg maximum load limit. As well as some padding to the seating, there are aluminium armrests plus a side pocket. Seat height is 48cm and overall dimensions are 50cm wide, 65cm long, 104cm high. If you want a chair with a bit more lower back support than most, check this out. 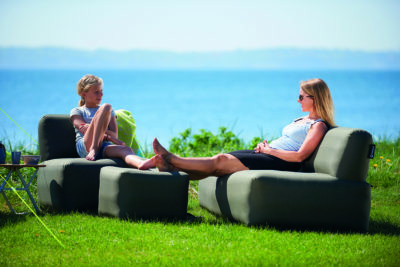 The appropriately-named Lumbar from Kampa comes with an adjustable support strap for such a purpose. There’s a bit of adjustment to the plastic feet, too, which always helps when you’re on uneven ground. Fixed armrests have a bit of padding, too. It’s an easy-opening design, with a load capacity of 120kg. Seat height is 46cm from the ground, and overall dimensions are 98cm x 66.5cm x 64cm, packing down to 96cm x 29cm x 23cm. Total weight is 5.2kg. Incredibly light, except on price. But, this is a special little chair. It weighs in at 1.2kg, including its rockers. Yes, rockers! The original Chair Two is a more typical four-legged design, but the Rocker really is a rocking-type chair. Clever use of aluminium poles for the main framework don’t just help keep the weight down, it also means this chair can take anything up to 145kg. The zipped carrybag, meanwhile, also rolls up to do duty as an adjustable neck/head rest. Ideal if you prefer a wider than normal seat (50cm) with oversized arms and a bit more padding than usual. It’s a bit bulkier than most for folding down, too, but there’s a strap to tighten it all up – getting it down to 100cm x 50cm x 22cm. Maximum load is a hefty 120kg and the whole chair weighs 6kg. 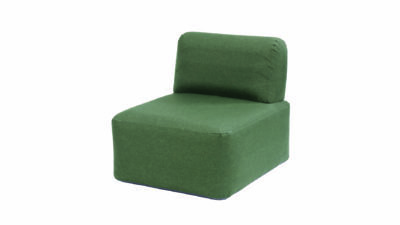 It’s easy to fold out – when dimensions are 90cm x 60cm x 92cm and the height of the seat from the ground is 47cm. Shown here in a black and grey colouring, it’s also available in a much brighter paprika and cream finish. Key features Powder-coated steel frame, 600D Q-tex weave fabric (Oxford polyester), carrybag. How about an inflatable chair? They’re certainly light in weight, don’t have the bulk (and framework) of conventional chairs and, arguably, they offer better support in that you can have such an item as hard or soft as you like. The lack of any metal framework also means you’re unlikely to suffer or cause any accidental damage. They’re fully waterproof and easy to wipe clean, too. The Abernel chair here is one of a number of “Lake” inflatable seating items from Outwell – also available are sofas and Ottoman footstools. It will take weights of up to 115kg, weighs 3.8kg, inflates from a pack size of 42cm x 38cm x 17cm to 68cm (wide) x 83cm (deep) x 74cm (high). Pumps, manual or electric, are sold separately. 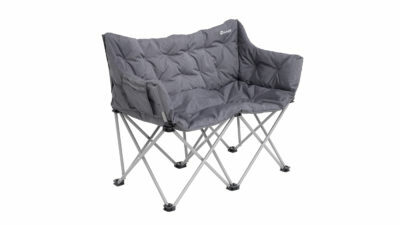 Got any advice on outdoor chairs you’d like to pass on to fellow Caravan Guard blog readers? Please feel free to add a comment below. I have used several different chairs over the years, the best I have found is a folding directors chair. 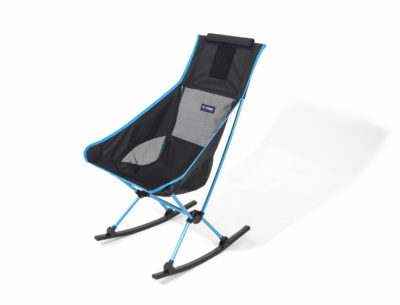 Mine has a very light aluminium frame but is incredibly strong (easily takes my weight and I am over 20 stone) It also has a folding table on one side and some useful pockets on the other. Excellent for relaxing with a drink with a spare one in the pocket. It is also one of the most comfortable folding seats I have ever met. I don’t know if chairs the same as mine are still available as I have been using mine for 20 years, but Amazon appear to have something very similar for around £40. Check the reviews and you should be able to find the good ones. Informative. Some good suggestions. Price of some chairs are to high. But as suggested you get what you pay for.